St.Pr.St. Ronja and Don Frederico have produced the full brother to Oldenburg Licensed stallion and Bundeschampionate qualifier winner Darnell. This colt is every bit as impressive as his big brother and oozes presence. He is by the legendary Don Frederico, who was named Hanoverian Stallion of the year in 2012 and who has sired many Champions and Grand Prix horses. This colt has a very regal look and is already strutting around the fields as if he owns the stud! We have named him Larkshill Divinity as he is totally divine! Divinity was the Champion at the Hanoverian Regional Show! He was impeccably behaved and received wonderful comments by judge Lynne Crowden and we are thrilled to confirm he will be raised as a stallion prospect! Don Frederico was proclaimed Hanoverian Stallion of the Year 2012. He is by the legendary Donnerhall out of Cleopatra (by Consul). The black stallion comes from the Schwanjungfrau mare line, which also produced licensed stallion Lanthan. Don Frederico was licensed in 1999 and named Champion stallion. He sold to the Celle State Stud and did his stallion performance testing in Adelheidsdorf. He finished second in a field of 45 with a dressage index of 151.67 points. He competed at the Bundeschampionate as a 5- and 6-year old and was the first state stud owned stallion to compete in the Nurnberger Burgpokal Finals in 2006. Don Frederico's breeding success was apparent quickly. From his first crop came Bundeschampion Dantonisius and reserve Champion Dark Carlotta. Both are out of Weltmeyer dams. Several of his offspring have moved to international Grand Prix level, including German Olympic team horse Diva Royal (out of a Warkant dam). Isabell Werth's internationally competed GP horse Don Johnson as well as Elin Aspnas' Swedish Young Riders team horse Donna Romma are also by Don Frederico out of a Warkant dam. As of 2013, Don Frederico has 27 licensed sons with the Hanoverian Verband, including the 2012 Bundeschampionate bronze medallist Don Darius and the 2008 World Young Horse Champion Dramatic. 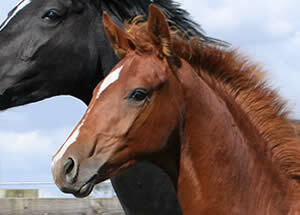 He has more than 2,500 Hanoverian registered offspring, of which 205 are State Premium candidates.